Professor Arthi Jayaraman from the Department of Chemical and Biological Engineering at the University of Colorado is the inaugural winner of the CoMSEF Young Investigator Award. Arthi joined the University of Colorado, where she is currently the Patten Assistant Professor, in 2008 after performing postdoctoral research at the University of Illinois and a PhD at North Carolina State University. 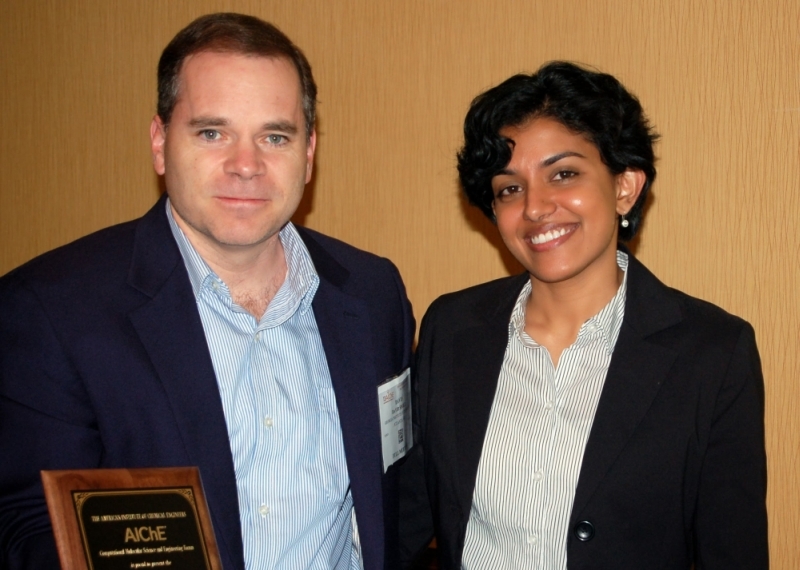 With this award, Arthi is cited “for insightful theory and simulation studies of polymers, linking molecular interactions to morphology for optimal design of materials for energy and biomedical applications.” Arthi will receive her award during the CoMSEF Plenary Session at the 2013 AIChE Annual Meeting, where she will also give a talk describing her research. The CoMSEF Young Investigator Award for Modeling and Simulation will be awarded annually to a member of CoMSEF who is within 7 years of completion of their highest degree in the year of the award.